However, next time I came to work and install different Mac/Windows computers which are not the same machine but the exact the same version of macos and windows and I never got them to work. Since installing it on them at work, my both home mac/windows started to fail to connect. I have tried to reinstall as the instruction I found here (remove completely and fresh install it again), did not help me to fix the issue. It has been sitting like this for 5 days and I have also created a ticket but no one has been contacted me to resolve this issue. I hope some one can help me to resolve this issue. I really want this working, but I feel like I totally wasted my money and time on this. It sounds like you've done great troubleshooting. I'm not able to open the log on my end. Don't post the whole log here, but when you save it and view it, you should get a URL you can share. You're using the 2.0.9 version, right? It has several re-connections fixes. I will re-attach the log in here below. Basically, this segment is just over and over in the log. and also, it's Synergy 2.0.8. This is after updating to 2.0.9 :'( so it didn't resolve the issue. I'm not too sure if I need to re-install (fresh install) this. Restarting the Synergy service on each machine sometimes helps. So, I re-installed and also as you mentioned, I tried to restart Synergy service as the instruction below, however it didn't change anything. 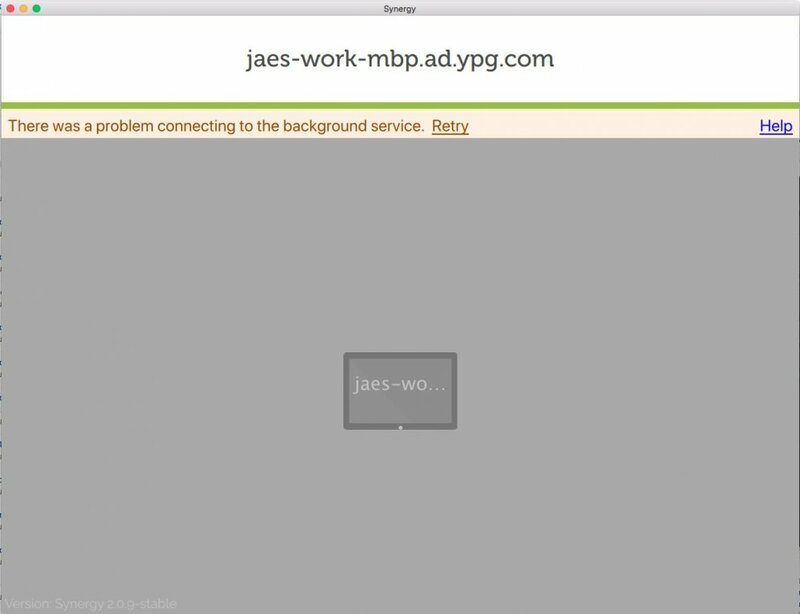 I still see the a problem connecting to the background service. I also attached the log below. I have tried that, but it still shows me the same. another log file, not sure if this helps. I think I've run out of troubleshooting level ideas. Support has been pretty fast recently. Yes, I have contacted them and been asked to install 2.0.9, but it didn't help. I am still waiting for their response so I guess I will see. If I can use Synergy 2 at home at least, I wouldn't worry too much about it but I cannot use Synergy at all. (home nor office). Hope I have other choices. Issue could be you have a proxy server between you and the internet at work. Synergy 2 doesn't support this configuration, and despite Nick promising months ago that it would be added to the "next release", such support no longer appears on the roadmap at all. Sorry for the delay, proxy support is imminent. However, background service issues (OP) aren’t caused by lack of proxy support (that’s actually a bug). So that’s a separate issue to the OP. If I added extra, this issue is not only affecting in my office computers. It is not happening to my home computers as well. So basically, I am not be able to use Synergy 2 completely. None of my mac/windows computers are working with Synergy 2. I have installed Synergy in new computer at home and it still gets the same error and I only can think, it some how referencing my previous network settings? or profile?? Anyways, if this is a bug, can it be fixed soon? so I am going to be able to use it soon? yes, I have contacted the support, but other than installing newer version (2.0.9) nothing was given. Please let me know what I need to do regarding to resolve this asap unless I will need to ask to refund which will be completely wasting my time for all of this. I've got a response from the support and I was able to install Synergy 1 finally. It actually didn't work at first and I need to switching server/client back and forth a couple of times between Mac and Windows. In short, I got it working!! Thanks for the help. I guess I will stay away from version 2 for a while, however, I am not too sure if I should be able to install this on my work computers and use it..
FYI, in Synergy 2, can you guys add a switch that can change server/client manually? I see in the beginning of the log, client kept being refused to connect and after I was switching them a couple of times, it got me working somehow.. hmm weird..
Anyways, thank you so much for all the help! I bought Synergy some months ago and it worked the first day but its not worked since then. I have shared multiple emails with support and its still not working. I have also installed 2.0.9 and its still showing There was a Problem Connecting to the background service - Retry. Basically, I am not able to use it. Can you help out or should I just ask for refund. Re-submit the support ticket. That gets your. Issue in front of the developers. Basically, the DYI troubleshooting is stop/start Synergy service and retry... next step is a though uninstall from all machines then reinstall. Reboot all. In my system, I think the key to good operation has been the thorough uninstall. I'm lazy, I use a 3rd party uninstaller, Revo. They have a free version. But, full circle, keep on support's list. If you have a really unusual situation, they want to learn from your issue. I would suggest to install Synergy 1. None of the restart services on both Macos/Windows and re-installing solution didn't work at all. Even Synergy 1, I need to switch mater/client back and forth finally helped me to use properly. I think you will need to create a ticket/reply the current ticket for Synergy 1 to try. I would say give a try Synergy 1.